Offering you a complete choice of products which include non woven chef cap. Since our commencement, our firm is engaged to introduce a premium quality array of Non woven Chef Cap. The offered cap is used in various restaurants, hotels, food eateries and even at homes. This cap is crafted utilizing quality fabric and latest machines by our professionals at our manufacturing unit. In order to offer attractive cap to the clients, we design and use a variety of colors and threads to woo the users. Besides, clients can get the cap from us at industry leading rates. 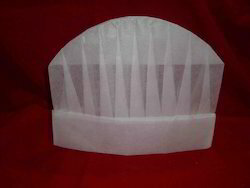 Looking for Non woven Chef Cap ?